Each year consumers spend thousands of dollars repairing damage from dish and antenna installations. The CommDeck Dish Mounting Systems address many of the issues caused by typical installation methods. Today’s typical installation consists of mounting the satellite dish directly to the roof or siding by using lag bolts to penetrate the roof or siding and sheathing underneath. Several problems arise when using this method. Permanent holes in roofing material leave roof susceptible to leaks causing ongoing damage and voiding roof warranty for the homeowner. 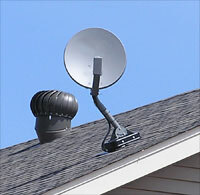 Mounting to roof or siding requires additional holes when upgrading service to a different dish. When dish is no longer in use, the installer typically leaves foot attached to roof because they are unable to repair holes left behind. 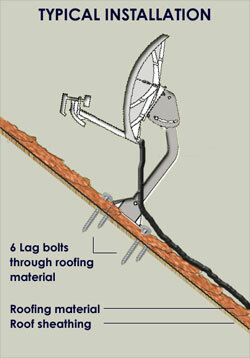 Over tightening lag bolts and wind vibrations cause lag bolts to loosen, leaving the dish unstable. This can cause loss of picture and will require a service call. Under repeated wind-loads the lag bolts can loosen and eventually require the dish to be relocated. Mounting the dish to siding limits the line of site required for dishes and the different levels of service, eliminating possible future changes. Requires exterior wiring to be clipped and screwed to roof and siding. By using the CommDeck dish mounting system, the above issues are eliminated.